When knitting horizontal picked-up bands, sweater patterns give you a pick-up rhythm, something like, “Pick up 3 out of every 4 stitches,” or they give you a total number of stitches to pick up. When you pick up stitches along a vertical edge and knit the band from there, you’re working at a right angle to your knitted piece — stitches to rows. One inch of rows on the vertical edge has to match 1 inch of stitches on the band you’re knitting. Most of the time, this means picking up a few stitches and then skipping 1 stitch at regular intervals — a pick-up rhythm. 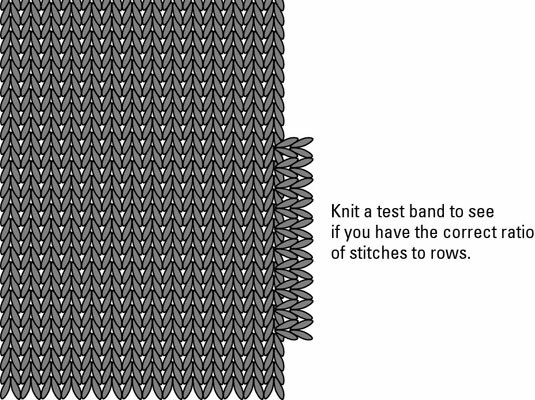 With horizontally knit bands that you knit with the rhythm method, you don’t worry about getting a particular number of stitches into a band. Instead, you’re concerned with a ratio of rows to stitches. Along the cardigan edge (or along your gauge swatch), pick up 32 stitches and work in the rhythm that your pattern gives you. Work the stitches for 1 inch, and then check the edge you’ve made. Be honest. If the band is nice and flat and doesn’t pucker, stretch, or distort the front edge in any way, you’re on. If the test band puckers and draws in, you’re skipping too many stitches. Instead of 3 out of 4 stitches, try 4 out of 5 or 5 out of 6. And if the band stretches the edge of your sweater, you aren’t skipping enough stitches. Try picking up 2 out of 3. Keep experimenting until you get the right ratio. Rip out those test stitches and pick up the stitches in the same way all along the edge.